The former record for the youngest climber to scale Everest had been held by Temba Tsheri of Nepal. He reached the peak at age 16. Also Saturday, officials said a Nepalese Sherpa who lives in the Salt Lake City suburb of Draper broke his own world record by climbing Everest for the 20th time. Apa, who goes by one name, went up with fellow climbers on a mission also to collect garbage, a growing environmental problem on the mountain. Mountaineering Department official Tilak Pandey said several climbers took advantage of Saturday’s clear weather to reach the summit. Jordan’s climbing team reached the peak hours earlier than expected. “The first thing, they all hugged each other and said, ‘I love you, I can’t believe we’re finally here’ and started crying,” said Rob Bailey, the team’s spokesman, by phone from the United States. Jordan, from Big Bear, California, was climbing Everest with his father, his father’s girlfriend and three Sherpa guides. He left for the peak from the base camp on the Chinese side. Everest was his first challenge above 26,240 feet (8,000 meters). Unlike neighboring Nepal, the other approach to Everest, China has no age limit for climbers. Jordan registered with Chinese officials in April, said Zhang Mingxing, secretary general of China Tibet Mountaineering Association. No interview with Jordan would be possible until he returns to advance base camp, which could take a couple of days, Bailey said. Climbers stay overnight at three or four camps before the summit, depending on their route and pace. Jordan carried a number of good luck charms, including a pair of kangaroo testicles given to him by a friend who has cancer. “That’s the one that probably meant the most,” Bailey said. At the summit, Jordan left behind his lucky rabbit’s foot and planted some seeds that a Buddhist monk at a local monastery had given him for luck on his journey, Bailey said. Then he took the satellite phone and called his mom. Jordan continues the recent trend of young adventurers. Earlier this month, 16-year-old Australian Jessica Watson became the youngest person to sail around the globe solo, nonstop and unassisted. Thousands lined Sydney Harbor to cheer as she cruised past the finish line in her pink yacht. A Dutch court late last year blocked an even younger sailor, 14-year-old sailor Laura Dekker, from pursuing a similar round-the-world voyage, ordering her to prepare more and wait at least until this year before starting. 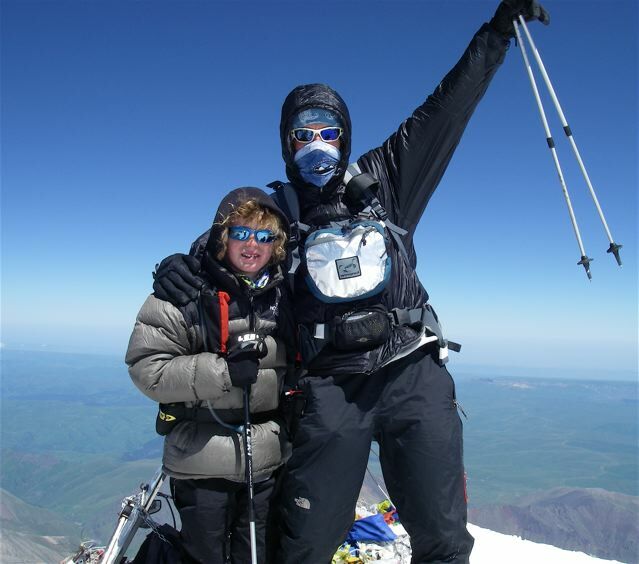 And in January, 17-year-old Johnny Collinson of Utah became the youngest person to climb the highest peaks on all seven continents. Just one mountain remains in Jordan’s own quest to climb those peaks, the Vinson Massif in Antarctica. Jordan’s team leaves for Antarctica in December, Bailey said. “A piece of cake,” his mother said. This entry was posted on May 22, 2010, 10:38 AM and is filed under humorous stories, mountain/skyscraper climbing, OTHER PEOPLE'S STORIES. You can follow any responses to this entry through RSS 2.0. You can leave a response, or trackback from your own site.